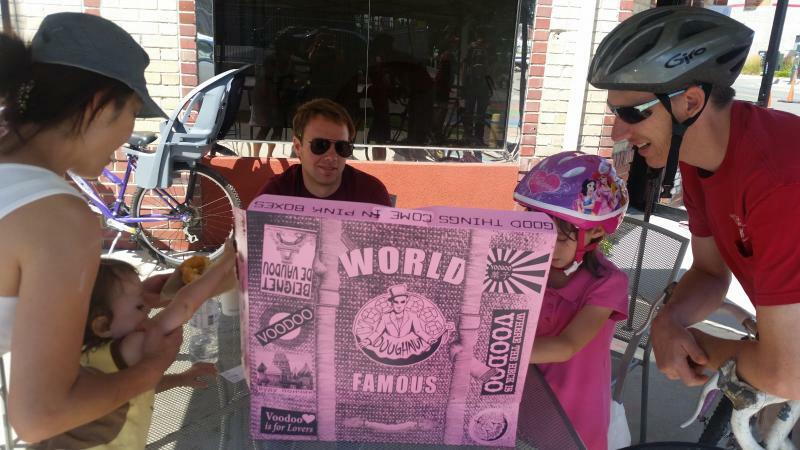 Promoting economic vitality, transportation options, and great places for people along West Colfax through "pop-up" design. Colfax Avenue is the longest “Main Street” in the country and a Denver icon. With the highest bus ridership in the region’s system, as well as a new light rail line and multi-use trail just a few blocks to the south, Colfax has the potential to become one of the City’s premier multimodal corridors. Yet the conditions along the corridor are unpleasant and often unsafe for pedestrians and bicyclists, and challenging for retailers. 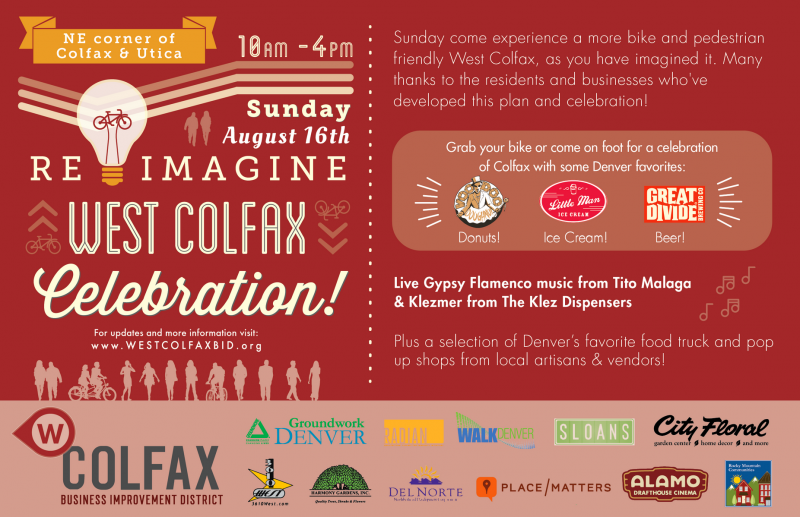 Through temporary installations, Re-imagining West Colfax will demonstrate design solutions for Colfax and north-south connections that calm traffic; enhance the pedestrian and bicycle environment; create a sense of place; and support local business development. Project partners including the West Colfax Business Improvement District, WalkDenver, PlaceMatters, Groundwork Denver and Radian will use data and community input to identify top destinations along Colfax and a priority path that links these destinations via walking and biking. We will work with business and property owners, residents, and public agencies to design and install “pop-up” features along this priority path such as intersection enhancements and protected bike lanes. A one-day community celebration on August 16 will draw attention to and invite community members to interact with the temporary design solutions. Our goals include building support for longer-term, permanent changes to the design of West Colfax; raising awareness of the benefits of walkable and bikable neighborhoods; promoting neighborhood amenities, walking, and biking along West Colfax; connecting residents to West Colfax businesses; and improving mobility for low-income residents who may not be able to afford a car. The West Colfax BID, WalkDenver, PlaceMatters, Groundwork Denver and Radian will work collaboratively to carry out this project. Below are the specific tasks and the partner that will take the lead on each. The Gates Family Foundation has generously provided $40,000 in grant funding to support these partners’ time and a portion of the direct costs. We just need an additional $10,956 for the specific items listed in the budget below. Data analysis. PlaceMatters will lead the effort to combine data from the WALKscope pedestrian data collection tool with other data sources to identify high priority areas for improvements and the types of design solutions that may be appropriate in these areas, with particular attention to addressing the mobility needs of low-income residents. Community input. Radian will lead the effort to gather community input focused on identifying the top destinations for walking and biking in the Colfax Corridor; one or more priority paths that links these destinations, including desired locations for enhanced Colfax crossings; and barriers that discourage residents from walking or biking more often. Design workshop. Based on the results of the data analysis and community input, the project partners will identify one or two key Colfax intersections/blocks as the location for a “pop-up” demonstration. The partners will then host a half-day workshop with community leaders, business and property owners, professionals with expertise in complete streets design, and public agency representatives to develop a detailed design for one or more temporary installations that will demonstrate traffic calming, bike and pedestrian enhancements, and placemaking. Planning and installation. WalkDenver will lead the effort to develop and carry out a detailed plan for installing the “pop-up” design that results from the design workshop. This specific project stems from the BID’s efforts over recent years to leverage investment in the light rail transit infrastructure in order to improve the walkability of West Colfax and stimulate the creation of local neighborhood serving retail. These efforts include the development and installation of new transit amenities on West Colfax and a neighborhood-wide wayfinding system focused on connections across and along Colfax. Based on extensive analysis of existing walking conditions by WalkDenver and PlaceMatters and evidence of the benefit to retail sales from improved biking conditions, the BID now looks to explore strategies to rightsize the Avenue and add pedestrian and bicycle facilities to tackle the challenge of a neighborhood bisected by an major arterial, and characterized by high traffic speeds, long crossing distances, and a lack of crosswalks or a buffer between pedestrians and autos. In the face of continued, rapid growth, the Denver region has begun a shift toward more sustainable development patterns, including significant increases in density and a major expansion of the transit system. Our neighborhoods and transportation system remain incomplete, however, as long as people are unable to access transit stations and neighborhood destinations on foot or by bicycle. Everyone is a pedestrian at some point in their day, and walking and biking are the most accessible and affordable forms of transportation. Walkability and bikability are therefore the foundation of smarter, greener, healthier communities. Shifting from car-oriented to people-oriented communities requires new ways of thinking about our built environment and public places. 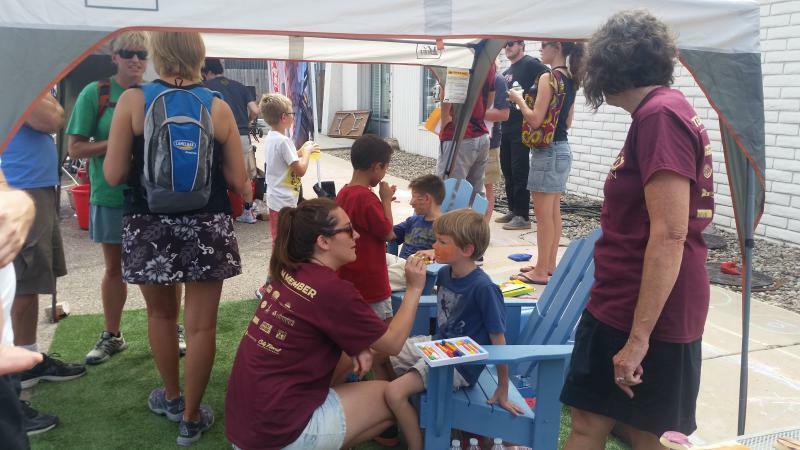 Quick, low-cost demonstration projects are a great way for communities to experiment with different design options, learn about the connection between the built environment and quality of life, and generate support for sustainable, longer-term solutions. Walkability and bikability is particularly important for the one-third of Americans who don’t or can’t drive, including all children under the legal driving age, people with physical or mental disabilities, about one-fifth of seniors, and many low-income households that can’t afford cars. Walkable and bikable neighborhoods also benefit small local businesses that often can’t accommodate customer parking. And research shows that businesses in walkable and bikable areas generate more revenues and contribute more in local taxes, compared to auto-oriented commercial districts. 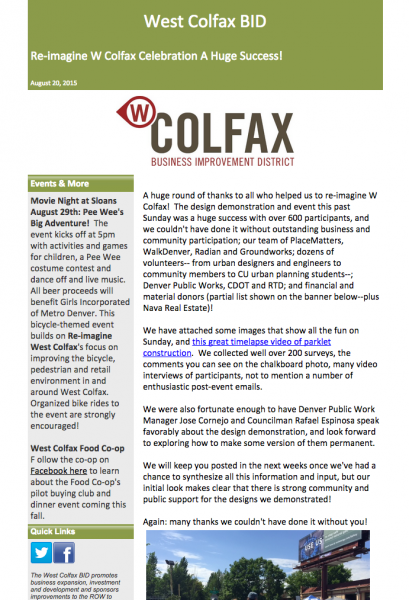 Re-imagine West Colfax Parklet Construction from PlaceMatters' Videos on Vimeo. Re-imagine West Colfax - Ian Kane Mural from PlaceMatters' Videos on Vimeo. 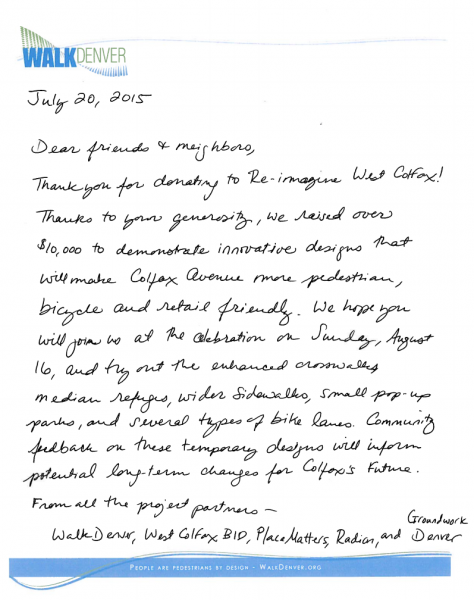 "We are happy to announce that the Re-imagine West Colfax project in Denver, CO was a true success! The project was to show how walking and biking in West Colfax, a major auto-centric road in Denver can be improved. We had over 600 participants on August 16th. 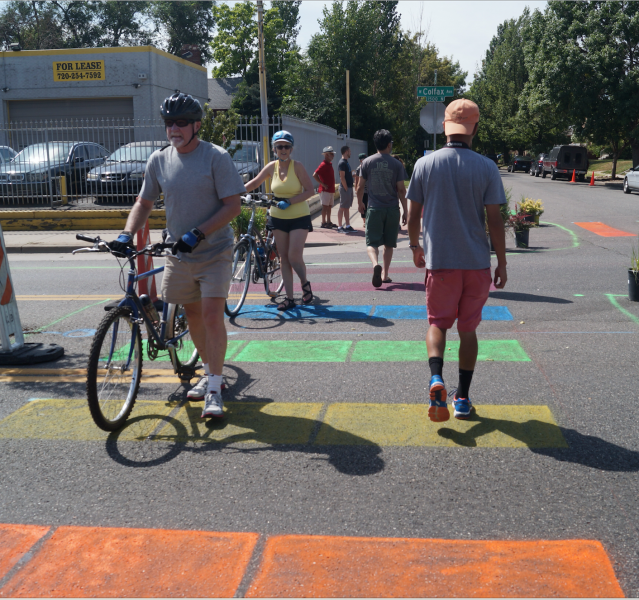 They came on foot and by bike to enjoy wider sidewalks, newly painted crosswalks and an amazing parklet! In addition there was a VooDoo tour du doughnuts! 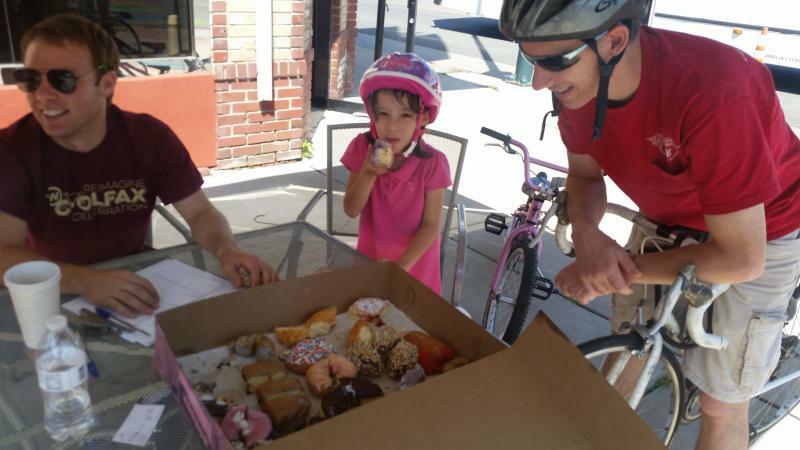 Riders could experience different types of bike lanes and provide feedback at several tour stops where they also received doughnuts. We collected 413 survey responses from participants to gather their feedback on the temporary design demonstrations, and which elements they would most like to see made permanent. We will be sharing this feedback with city officials and discussing the possibility of longer-term changes to the Colfax Corridor." Please enjoy these photos and videos! Bailey Wildfires - Can we get out alive? Volunteers can assist with designing and installing the “pop-up” demonstrations, as well as planning and carrying out the community celebration.